We’re super excited to bring our first Shop Management Workshop of 2018 to San Diego! 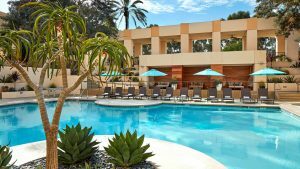 The dates are April 26-28 and the venue is the San Diego Marriott Mission Valley. For anyone on the East Coast or in the Midwest, San Diego’s average April temperatures of upper 60s will sound mighty good right about now! But more important, we’ve put together a value-packed training event that will help you master the Manager™ SE shop management software. You’ll come away with a wealth of tips, tricks and best practices that you can immediately put to use in your auto repair shop. The two-day training session covers the features and functionality of the Mitchell 1 Manager™ SE system and is led by John Dwulet, senior product manager, and myself, senior product market manager. Together, we offer over 40 years of Manager product expertise. Workshop topics include program workflow, setup values, inventory, reporting, tips, advanced transactions, parts catalog integration, a detailed look at the new Scheduler module, plus the Open Recalls feature and Connected Car concept. We’ll be running the latest version of SE so that you will gain an understanding of what is coming soon. Increasing users’ confidence, efficiency and profitability is our number one goal. You’ll also have the option of practicing the skills you are learning in the classroom session in a hands-on computer lab staffed with product experts from our Mitchell 1 headquarters. While the primary mission of the workshop is to review Manager SE and give you new ideas and an improved set of skills to take back to your shop, you’ll also learn how Mitchell 1’s SocialCRM auto shop marketing service integrates with Manager SE. During a relaxed evening reception, we’ll touch on the benefits of customer reviews and other features in SocialCRM service and also talk about new marketing concepts and how to capitalize on your shop management data to further grow your businesses. Attendees will also have the opportunity to learn more about our other products during breaks and meal times. The new Manager SE Truck Edition extends the management system to medium and heavy trucks, and ProDemand with SureTrack are providing technicians with comprehensive OEM information and real-world fixes from professional technicians. If you’re an experienced Manager user, the workshop will provide comprehensive training that increases the value of your software investment. If you’re more of a beginner (using the product for at least 6 months is required), you’ll be amazed at how many workflow ideas you’ll take home to run your business more efficiently. The interaction between attendees sharing methods and tips, plus the new friendships everyone takes home, is priceless. We hope to see you in San Diego! Get all the details and register on the Shop Management Workshop website. Also read the Press Release. Prev:Active Recall info for Fiat Chrysler vehicles added to Manager SE! Next:Now Only Enter the Vendor Invoice Number ONCE!